Kubla the kid goat, son of Khan, the King of the Kashmir Kingdom goat farm, has been kidnapped, and Duck Duck is all quacked up about it. Izzy the Tennessee Fainting Goat is too spooked to help much, and Joey has gone deep into the forest all by himself to attempt a rescue! But the coy dogs are lurking in the dark shadows, and the goat-napping kidnapper has a trap set for him. Joey is in trouble, and there are no butts about it. Patch the Pirate is on the way with his crew, but can they arrive in time to save the day? 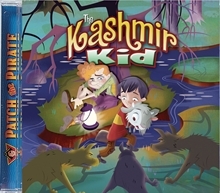 Find out with The Kashmir Kid, and learn the importance of seeking the lost wherever they may be.